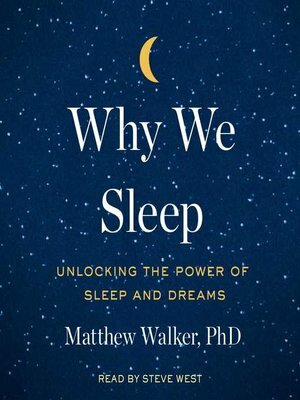 The first sleep book by a leading scientific expert—Professor Matthew Walker, Director of UC Berkeley's Sleep and Neuroimaging Lab—reveals his groundbreaking exploration of sleep, explaining how we can harness its transformative power to change our lives for the better. Walker answers important questions about sleep: how do caffeine and alcohol affect sleep? What really happens during REM sleep? Why do our sleep patterns change across a lifetime? How do common sleep aids affect us and can they do long-term damage? Charting cutting-edge scientific breakthroughs, and synthesizing decades of research and clinical practice, Walker explains how we can harness sleep to improve learning, mood, and energy levels; regulate hormones; prevent cancer, Alzheimer's, and diabetes; slow the effects of aging; increase longevity; enhance the education and lifespan of our children, and boost the efficiency, success, and productivity of our businesses. Clear-eyed, fascinating, and immensely accessible, Why We Sleep is the crucial account on sleep that will forever change readers' minds on the subject.